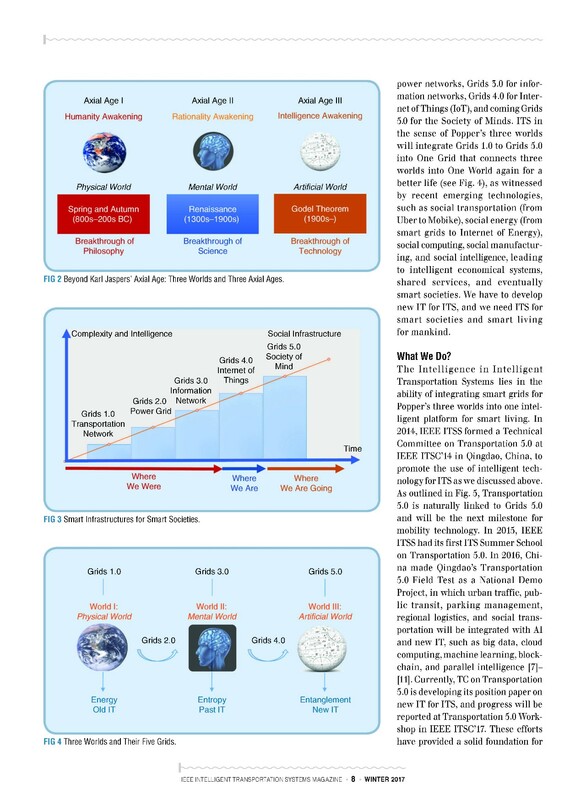 【引文格式】Fei-Yue Wang, Artificial Intelligence and Intelligent Transportation -Driving into the 3rd Axial Age with ITS, IEEE Intelligent Transportation Systems Magazine, Winter 2017, 6-9. 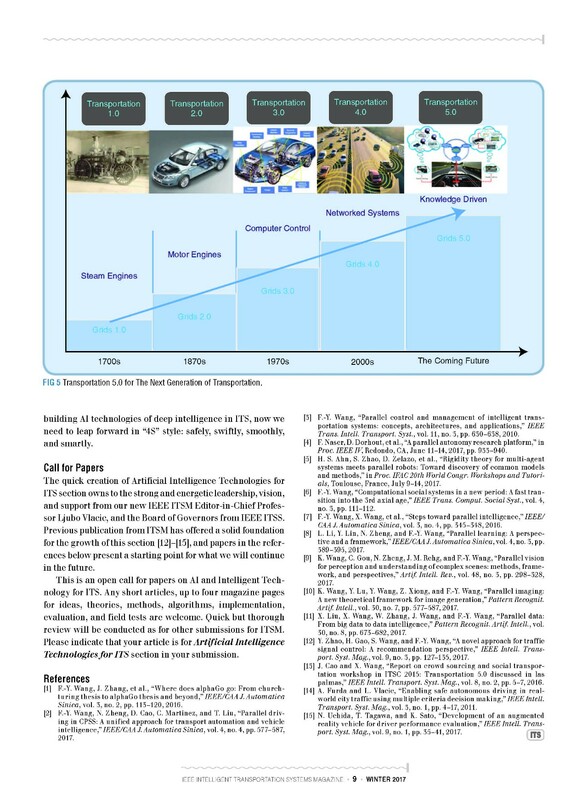 Fei-Yue Wang, Jason Zhang, et al, Where Does AlphaGo Go: From Church-Turing Thesis to AlphaGo Thesis and Beyond, IEEE/CAA Journal of Automatica Sinica, Vol. 3, No. 2, pp.113-120, 2016. 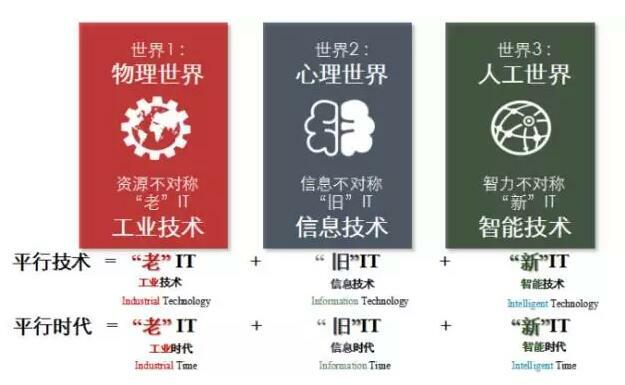 Fei-Yue Wang, Nanning Zheng, Dongpu Cao, Clara Martinez, Teng Liu, Parallel Driving in CPSS: A Unified Approach for Transport Automation and Vehicle Intelligence, IEEE/CAA Journal of Automatica Sinica, Vol. 4, No. 4, pp.577-587, 2017. Fei-Yue Wang, Parallel Control and Management of Intelligent Transportation Systems: Concepts, Architectures, and Applications, IEEE Transactions on Intelligent Transportation Systems, Vol.11, No.3, pp.630-638, 2010. F. Naser, D. Dorhout, et al , A Parallel Autonomy Research Platform, Proc. of IEEE IV 2017, pp.933-940, June 11-14, 2017, Redondo, CA, USA. H. S. Ahn, S. Zhao, D. Zelazo, et al, Rigidity Theory for Multi-Agent Systems Meets Parallel Robots: Toward Discovery of Common Models and Methods, Workshops and Tutorials, IFAC 20th World Congress, Toulouse, France, July 9-14, 2017. 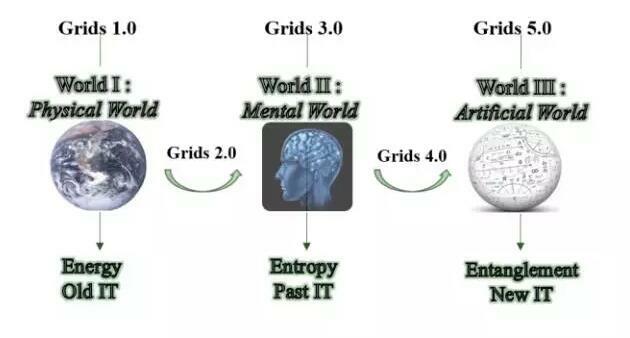 Fei-Yue Wang, Computational Social Systems in a New Period: A Fast Transition into the 3rd Axial Age, IEEE Trans. on Computational Social Systems, Vol. 4, No. 3, pp.111-112. Fei-Yue Wang, Xiao Wang, et al, Steps Toward Parallel Intelligence, IEEE/CAA Journal of Automatica Sinica, Vol. 3, No. 4, pp.345-348, 2016. Li Li, Yilun Lin, Nanning Zheng, Fei-Yue Wang, Parallel Learning: a Perspective and a Framework, IEEE/CAA Journal of Automatica Sinica, Vol.4, No.3, pp.389-395, 2017. Kunfeng Wang, Chao Gou, Nanning Zheng, James M. Rehg, Fei-Yue Wang, Parallel vision for perception and understanding of complex scenes: methods, framework, and perspectives, Artificial Intelligence Review, vol. 48, no. 3, pp. 298-328, 2017. 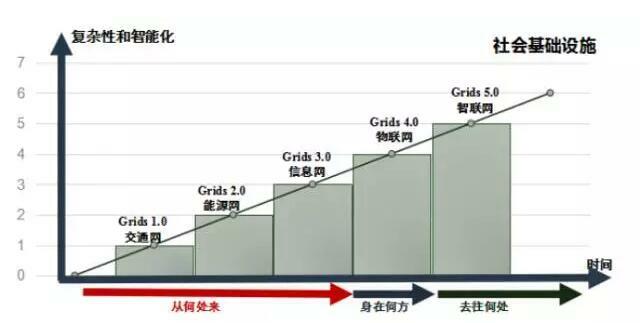 Kunfeng Wang, Yue Lu, Yutong Wang, Ziwei Xiong, Fei-Yue Wang, Parallel Imaging: A New Theoretical Framework for Image Generation, Pattern Recognition and Artificial Intelligence, vol. 30, no.7, pp. 577-587, 2017. 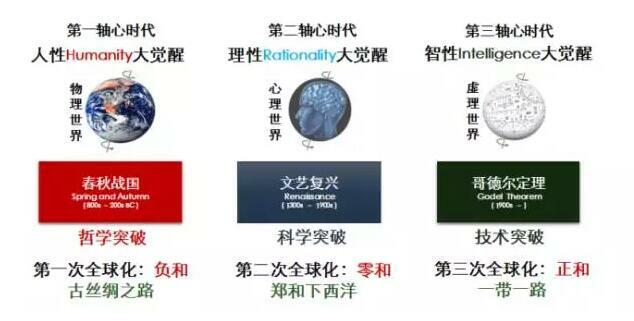 Xin Liu, Xiao Wang, Weishan Zhang, Jianji Wang, Fei-Yue Wang, Parallel Data: From Big Data to Data Intelligence, Pattern Recognition and Artificial Intelligence, vol. 30, no.8, pp. 673-682, 2017. Yifei Zhao, Hang Gao, Shuai Wang, Fei-Yue Wang, A Novel Approach for Traffic Signal Control: A Recommendation Perspective, IEEE Intelligent Transportation Systems Magazine, Vol. 9, No. 3, pp.127-135, 2017. 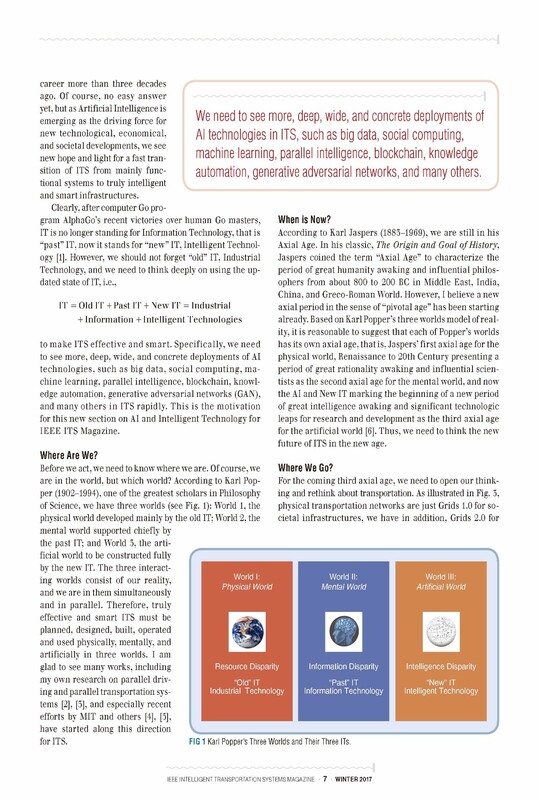 Jianping Cao, Xiao Wang, Report on Crowd Sourcing and Social Transportation Workshop in ITSC 2015: Transportation 5.0 Discussed In Las Palmas, IEEE Intelligent Transportation Systems Magazine, Vol. 8, No. 2, pp.5-7,106, 2016. Andrei Furda, Ljubo Vlacic, Enabling Safe Autonomous Driving in Real-World City Traffic Using Multiple Criteria Decision Making, IEEE Intelligent Transportation Systems Magazine, Vol. 3, No. 1, pp.4-17, 2011. Nobuyuki Uchida, Takashi Tagawa, Kenji Sato, Development of an Augmented Reality Vehicle for Driver Performance Evaluation, IEEE Intelligent Transportation Systems Magazine, Vol. 9, No. 1, pp.35-41, 2017. 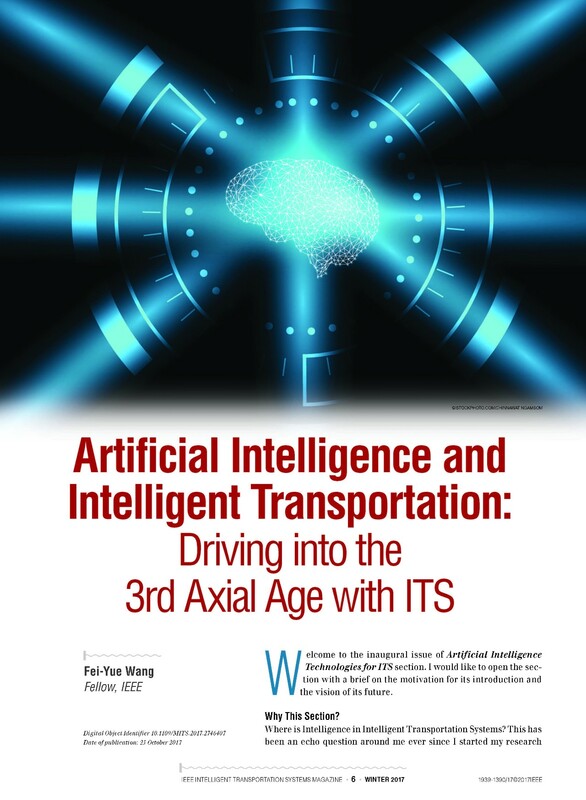 “Artificial Intelligence Technologies for ITS”, a new section in IEEE Intelligent Transportation Systems Magazine, publishes peer-reviewed short articles that provide either recently developed or recently implemented AI & Machine Learning methods in transportation systems and services. Any short (up to 4-pages) articles for ideas, theories, methods, algorithms, implementation, evaluation, and field tests are welcome. All manuscripts are peer-reviewed and must be submitted through Manuscript Central at https://mc.manuscriptcentral.com/itsm. 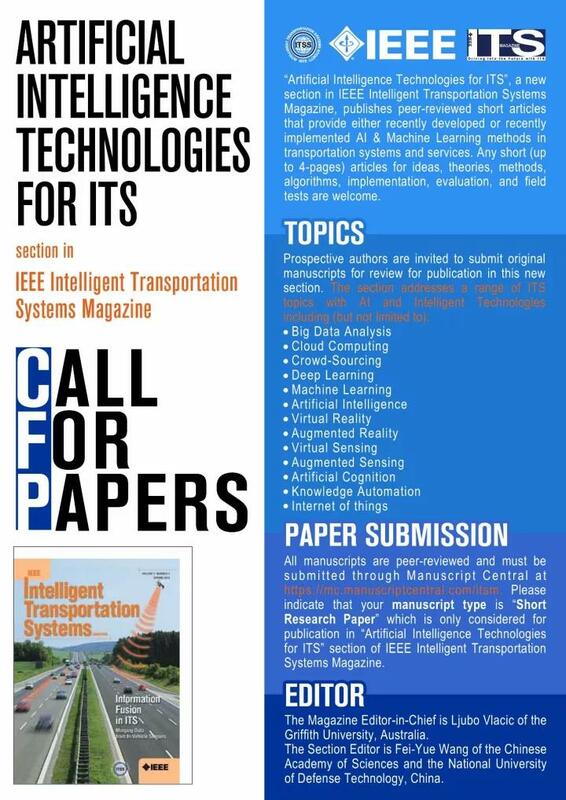 Please indicate that your manuscript type is “Short Research Paper” which is only considered for publication in “Artificial Intelligence Technologies for ITS” section of IEEE Intelligent Transportation Systems Magazine. The Magazine Editor-in-Chief is Ljubo Vlacic of the Griffith University, Australia. The Section Editor is Fei-Yue Wang of the Chinese Academy of Sciences and the National University of Defense Technology, China.